The year after Hurricane Hazel, our family moved from Cole’s Crossroads back into town. The roomy house boasted of two full bathrooms, a real luxury to my way of thinking in the mid-1950’s. No more waiting in line when you were running late on school days, no more annoying “hurry up in there” when you were soaking in a bubble-filled tub, reading your latest library book. One member of our family preferred the shower to the bathtub — Petey. We’d had our share of family pets for years, all of them outdoor types. Assorted dogs and cats romped and ran, clawed and scratched and begged to come indoors, but none of them were allowed to live inside, until Petey. He really didn’t belong to Harold or me, though, he was daddy’s bird. He owned a cage but mainly used it to swing in, or catch a snack of bird seed, or grab a bit of shut-eye at night. Petey the blue parakeet had the run of the house. He would come when daddy called his name or whistled for him, usually. If he was super interested in whatever he was doing at the time, however, he might not — and then daddy would stealthily drape an old blue shirt over his head and gather him up for a trip back to “beddie bye,” nap time in his cage. When not flitting hither and yon through the bedrooms, living room and kitchen, Petey had a couple of favorite perches. The top edge of the dining-room window where the room air-conditioner hummed away on hot days was one of them. Petey just loved the dining room wallpaper. The color of it. The texture of it. The taste of it! After a few sojourns atop the window there wasn’t much wallpaper left within beak’s reach, but nobody had the heart to shut him away from this taste treat. When zooming from living room to dining room when daddy was reading the morning paper, Petey’s favorite landing spot was daddy’s eyeglasses. He’d swoop to a graceful landing on daddy’s head, then hop to his eyeglass frames, clamp his little claws on and lean over with tail feathers at a forty-five degree angle, as if he was reading the headlines too. Daddy would fuss and Petey would chirp, and after a few moments he’d glide down to the table top to enjoy his after-breakfast toast left-overs. Daddy’s normal morning routine called for a shower followed by shaving and brushing his teeth. Petey seemed to think this ritual was designed just for him. He joined daddy in the shower, his cheery chirps heard loudly above the running water. He’d sit on the shower head for a few minutes, then flutter through the water to land on daddy’s shoulder, then flutter back up to the shower head and flap his little wings like crazy. While daddy lathered up, shaved and then tended to his teeth, Petey observed from the vantage point of the shower rod, merrily singing away the whole time. After Petey had been in the family for a time, daddy thought he might be lonely all alone in the house during the work day. Daddy made a trip to the pet store to purchase a playmate, a lady parakeet. I have no idea what Petey thought when he saw this lovely green and white apparition, but he immediately fell out of love with the humans in the family. Tweet-tweet and chirp-chirp duets were heard from atop the window sill from that time forward. Petey wasn’t lonely any more! I think daddy grew a bit lonely, though, as Petey abandoned his morning shower, newspaper and left-over toast ritual. Petey and his pal had never seen the outside world of course, and we were very careful to keep all the doors closed. The back-porch screen door was unfortunately ajar one day, the heavy door into the kitchen standing open. There was a blur of blue feathers as Petey zoomed by to explore this new “room” in his house — the great outdoors. No amount of cajoling, calling, whistling, or trying to tempt with birdseed could get him out of the dogwood in the back yard. Eventually he flew into the swampy woods behind the house. Every few hours we’d go out and call and whistle, call and whistle, but we never saw Petey again. We all missed his merry chirp, but his feathery lady friend missed Petey more. Never a human-lover, she didn’t perch on daddy’s eyeglasses, or zoom around the living room, or take refreshing showers in the morning. She sat on her little wooden perch, nibbled on her birdseed and swung on her trapeze, but without Petey she seldom ventured out of her cage. 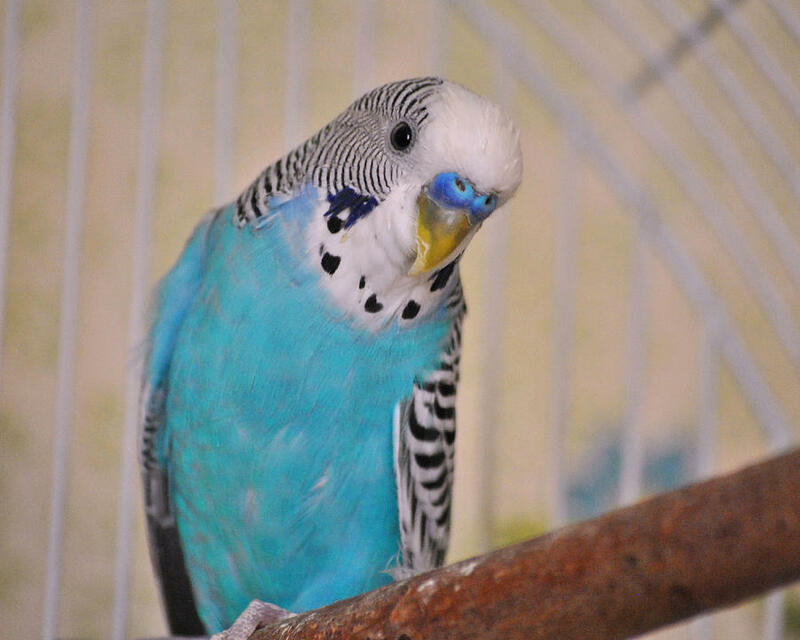 Petey had been the personality in that little family, and one-of-a-kind — the parakeet who sang in the shower. This entry was posted in 1950s, Childhood memories and tagged daddy, parakeet, Petey, shower. Bookmark the permalink.